New Year Resolutions often come with a desire to change a situation or circumstance from the previous year. In the USA where more than 70% of the population is battling either overweight or obesity, it is not surprising that losing weight is a priority for many. After navigating the “season of indulgence” that spans Halloween, Thanksgiving, Christmas and finally New Year, weighing in a few pounds heavier further fuels the resolve that comes with New Year resolutions. 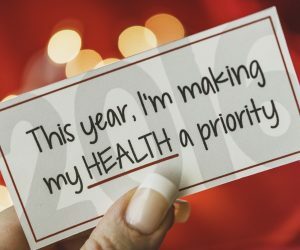 Resolutions usually accompany goals, such as “I would like to lose 20 Lbs.” or, “I would like to feel more comfortable” or, “I want to lose weight for a special event”. Perhaps your desire to reduce weight is linked to a health goal, such as lowering your blood pressure or blood sugar. No matter what your reason for your resolution, you need to have a plan to help you achieve your goal, after all a goal without a plan is just a wish! Recommendations for losing weight are numerous. Most include some form of dietary advice such as cutting down on Calorie intake, cutting carbohydrates from your diet, eating more protein, eating only “diet food”, following a vegan diet, intermittent fasting or clean eating to name a few examples. Weight loss guidelines usually also recommend an increase in Calorie expenditure through engaging in regular physical activity. Most dietary recommendations result in cutting Calories in some way because of the imposed food rules; and more up to date guidelines also aim to lower the body’s insulin levels (which is a good thing) to promote fat burning. High levels of insulin stop the body from using fat for energy and can further promote fat storage in fat cells so keeping insulin levels in check is essential to promote weight loss. Despite this and the plethora of dietary advice out there, research shows that at least 50% of people return to their original weight over time. I would like to recommend that we consider regulation of body weight from a different perspective. You can think of your metabolism like an “engine”. Just like the size and capacity of a car engine will determine its power, speed and fuel efficiency. So your metabolism will determine how efficiently you burn up the food you eat and your tendency to maintain a healthy weight, lose or gain weight. I have worked with individual clients for over 20 years, and have witnessed firsthand that people have different metabolic capabilities for various reasons. Improving your metabolism should be a priority if you want to address a weight problem. Just like a car engine is inside the car, so our metabolism is inside each and every body cell and affects your whole body’s metabolic capabilities. For years and years, we have all been told to: “Cut down, cut out and give up eating certain foods”. This means we put a lot of the blame on the food we eat for the weight problems we have. Seldom do “diets” address the need to boost metabolic capabilities. In reality weight problems are complex and multifaceted, nonetheless a potentially failing metabolism should not be ignored. What we should consider is that poor quality food choices (too few nutrients), high insulin producing foods, coupled with too little activity and inadequate sleep will all contribute to a failing metabolism and unwanted weight gain. So my recommendations for the New Year for everyone who has weight loss on his or her New Year resolution list, is that you commit not specifically to losing weight but to building a faster more capable metabolism. A faster “engine” that is capable of burning up more Calories and less likely to store body fat. Better metabolic capabilities will help you to lose excess body fat and will also help you to sustain a healthy weight in the long term. To improve your metabolic capabilities and lose weight certain key recommendations apply. To reach your goals you need to develop a plan on how you will implement these recommendations in 2018. Get Enough Sleep. Research has found that there is a significant association between short sleep (generally <6 h per night) and increased risk for becoming overweight. The recommendation is to get on average 7-9 hours sleep each night. Getting enough sleep seems to have an impact on your metabolic capabilities and also your risk for chronic disease. Set a goal for sleep and have a plan on how you will attain that goal. Set the time you will go to bed and the time you will wake up. Build your schedule around prioritizing sleep. Be more active. Build your “engine” by stimulating growth of mitochondria in each body cell. The mitochondria are the organelles (like the cylinders in a car engine) in all body cells that create energy from the food you are eating. Through regular physical activity you are able to stimulate your body to build additional mitochondria. This is called mitochondrial biogenesis. This means that you will be building your metabolic “engine” capacity. It also implies that exercise is not just useful because it helps you to burn up Calories each day, but will actually help you to improve your metabolism in the both the short and long term. All types of exercise are valuable. But high intensity interval training (HIIT) seems to be especially good for stimulating the generation of new mitochondria. It is a good idea to speak with your doctor/dietitian to find out what types of exercise are best for you.How much exercise do we need? According to the American College of Sports Medicine (ACSM), to lose weight and to prevent regaining it, you may need up to 250 minutes of moderate intensity exercise per week. That is 50 minutes five times per week or about 35 minutes each day. Recommended amounts of exercise do not need to be completed all at one time and can be accumulated over the day. Carving out time for exercise is important and also needs to be prioritized. Set smaller goals, if you have not exercised for some time. Develop a plan (when will you exercise, what type of exercise will you do, how long will you exercise for), implement the plan (schedule it in your calendar) and make exercise part of your daily routine to the point that it will eventually become a habit. Exercise will help to renovate a failing metabolism and is also a major contributor to weight maintenance success, as well as a greater sense of wellbeing. Improve your Nutrient Intake & the Quality of your Diet. It is important to realize that all metabolic functions in the body require nutrients (both large and small nutrient), often referred to as macronutrients and micronutrients. It is generally assumed that all the nutrients you need for your body to function optimally will be provided by the food you eat. Unfortunately this is most often not the case. When I consult with my clients for the first time, I usually analyzed each person’s diet. What I have found is that most people do not manage to meet their nutrient requirements from their usual food intake. My findings are consistent with what is considered common knowledge by the United States Department of Agriculture (USDA). Routine surveys (NHANES) conducted by the USDA show these same results, indicating that majority of Americans are not meeting their nutrient needs. This is very concerning, as how can you expect your body to function optimally with a sub-optimal nutrient intake. Micronutrients (vitamins, minerals and phytonutrients) are particularly important and work in different ways to help your metabolism function optimally. To draw an analogy, would you insist that you car engine run on gas alone, ignoring the need for water, oil, or electricity? The engine would soon seize. Amazingly the body is resilient and continues without an adequate nutrient intake. But sooner or later there is deterioration in health and in metabolic capabilities. So to help yourself to build a healthy metabolism, you need to make sure you meet your nutrient requirements. If you are intending to cut down on food intake, this will mean that you need to look at supplementing your micronutrient intake with a good multivitamin and topping up with a few other nutrients, such as magnesium and omega 3 fatty acids that are usually not available in adequate amounts in a good multivitamin. Once your nutrient intake is secured, you will find it easier to cut down and eat less. Go for food changes that will make a big impact. This is not a finite list – but certainly will help to put you on the right track. Follow a Structured Eating Plan. Limit how often you eat during the day. I often tell my clients that the food they eat has to have a label, specifically “Breakfast. Lunch, Dinner or Snack”. Aim to limit yourself to three moderate meals and three small snacks daily. Of course individual guidelines apply, and not everyone needs to snack. Restricting how often you eat each day, will help to control your Calorie intake, and give you a chance to lower circulating insulin levels, which will help with fat burning. If you are constantly eating, grazing or snacking, this can put your body under metabolic stress (from oxidative stress), which is not good for your metabolic capabilities. So be intentional with selected meals and be mindful of when you are eating. Choose Nutrient Rich High Quality Foods. Foods that are packed with nutrients offer the greatest health benefits and help to control appetite and boost metabolism. Aim to include at least five or more servings of vegetables, salad or fruit daily. A serving is equivalent to: ½ Cup cooked vegetables, 1 Cup raw vegetables, 2 Cups leafy greens, 1 medium sized fruit, or 1 cup chopped fruit. Choose fish and skinless chicken over red meat. Choose to use unsaturated fats such as; olive oil, avocado, nuts and seeds over other types of fat. Always use fat sparingly in your diet, as fat contains 9 Calories per gram. While I am not advocating for a low fat diet, an excessively high fat diet comes with its own metabolic consequences. Whole-grains such as wild rice, quinoa, spelt and millet are preferable over refined grain products. That being said, some people do better initially when they leave out grain products altogether. In all cases carbohydrate rich foods should be used sparingly at meals in order to control blood insulin levels, thereby promoting fat burning, and reducing the negative metabolic impact of an excessive carbohydrate intake. Give preference to water over other beverages. Water makes up about 50 -60% of your body weight, and water is used in the generation of energy and has a positive effect on metabolism. It is a very good idea to stay away from sugar, sugary foods and beverages. These foods generally will work against all your goals and your metabolic capabilities. High sugar intakes are associated with poor appetite control, high insulin levels, reduced fat burning capabilities, and metabolic stress (in the form of oxidative stress) when consumed excessively. So let 2018 be a year where you move from focusing on just “weight loss”, to a year were you commit to speeding up your metabolism. Weight gain is a symptom of an energy imbalance. Build a faster metabolism and weight regulation will be a whole lot easier.